HOW MUCH DO THEY EAT? 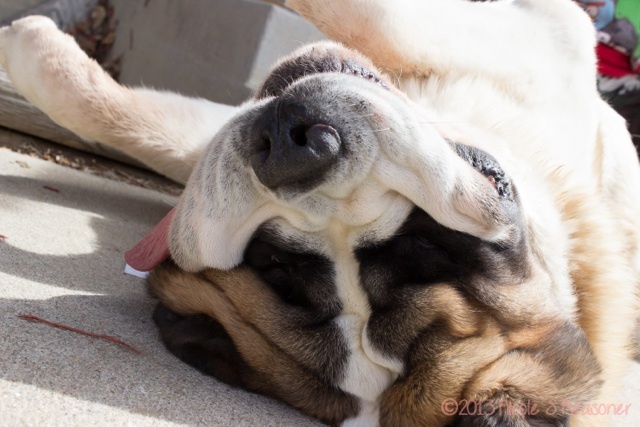 A Saint Bernard will not "eat you out of house and home." 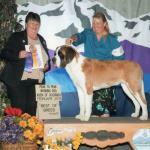 The fact is, a Saint Bernard can be raised and maintained on no more food than required for other large breeds. 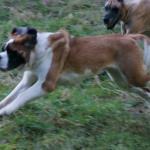 Since Saints are basically placid dogs, they generally require less food per pound of body weight than most smaller, more active breeds. HOW MUCH DO THEY WEIGH? Saint puppies weigh about one and one-half pounds at birth and grow rapidly during the first year, although it may take as long as three years before they reach full maturity. Adult males may reach a height of 28-30 inches at the shoulder and will normally weigh between 140 and 180 pounds. Females are somewhat smaller at about 26-28 inches at the shoulder and typically range from 120 to 140 pounds. ARE THEY GOOD WITH CHILDREN? Definitely. They have an understanding of a child's way and are amazingly careful not to injure a child. They are excellent babysitters and companions. Naturally, a child must never be allowed to torment any dog, regardless of breed. ARE THEY EASY TO TRAIN? 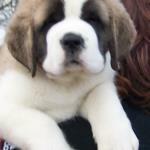 Because of the size of the animal, the Saint Bernard MUST be trained and this must be done early in his life. Fortunately, Saints are eager to please and will begin responding to commands as soon as they understand what you want of them. DO THEY SHED? Yes. Twice a year, usually in Spring and Fall, they lose much of their coats to help them adjust to the changing seasons. For the remainder of the year, there is seldom any annoyance from shedding. not drool to an offensive degree. WHAT ARE THE GROOMING REQUIREMENTS? 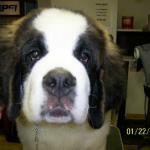 A Saint Bernard - whether long coat or short coat - should be brushed a minimum of once a week, along with a nail trim, and teeth cleaning. 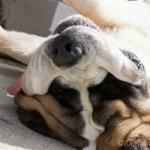 Unless they are being shown, they do not need to be bathed except every couple of weeks. Follow the bath with a blow-dry to ensure that the Saint does not get hot spots. 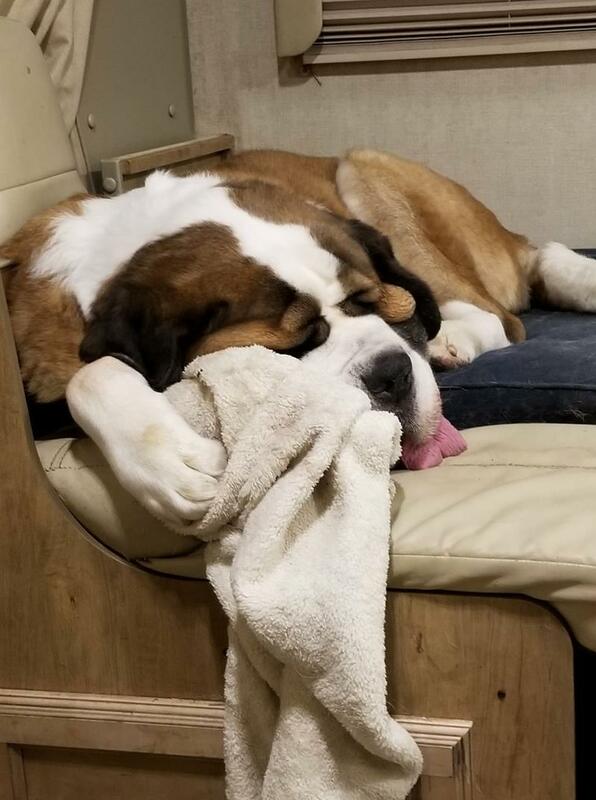 Never shave your Saint Bernard!! ARE THEY GOOD WATCHDOGS? The Saint's size and bark will discourage most intruders, yet he will learn to recognize your friends and receive them cordially. If an intruder gets by the size and barks, your Saint may decide to lead him straight to the family silver since he would much prefer to be a friend to all. The one exception to this is when a member of the family is being threatened. The Saint's instinct to protect those he loves becomes very apparent at this time. 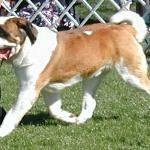 WHY DO SOME SAINT BERNARDS HAVE SHORT HAIR? 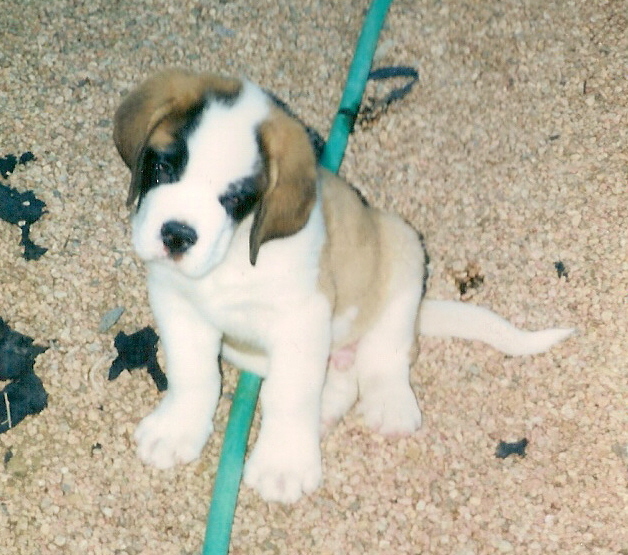 The original Saint Bernards were all short-haired dogs. Over 150 years ago. the Monks in Switzerland found it necessary to bring some new blood into their breeding and interbred the long coated Newfoundland with their Saints. 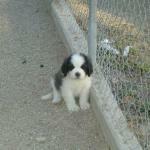 Today, the influence of that breeding is still with us and we have both long and short-haired Saint Bernards. 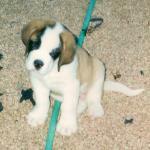 WHY DO SOME SAINT BERNARDS NOT HAVE A MASK? Although the mask is preferred, a correct head must be first considered. Any markings (such as mask) are then considered "icing on the cake"
HOW MUCH ROOM DO THEY NEED? The Saint by nature does not require acres and acres to roam. 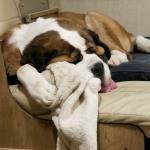 They are not as active or nervous as some breeds and are content to remain close to home for the most part. 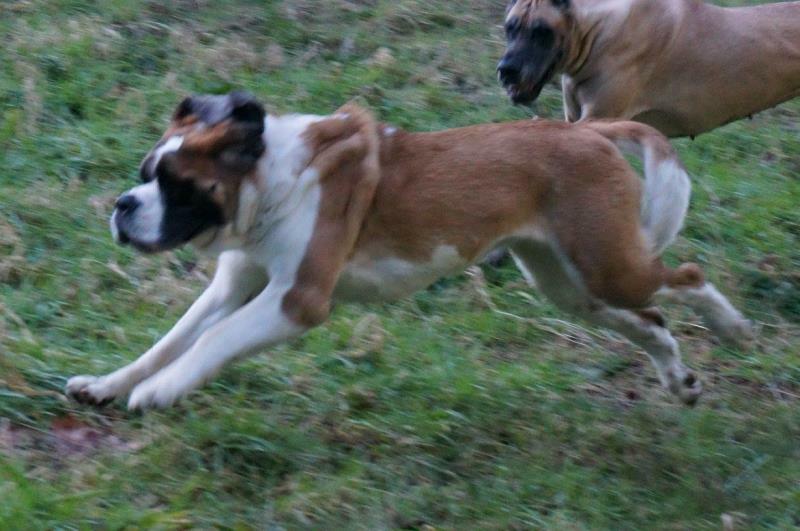 Consequently, a small fenced yard or kennel run is enough just so long as there is some place for regular exercise. The apartment dweller must be walked frequently to make up for the exercise he would normally take at his leisure. SHOULD I GET A MALE OR A FEMALE? This is strictly a matter of personal preference. Both are equal in pet qualities. The male, being larger, is more impressive when first viewed. The female, however, must be considered his equal in all other respects. Modern veterinary practice recommends neutering of non-breeding animals of both sexes as a means to a healthier, better pet. HOW DO THEY HANDLE THE HOT WEATHER? The dog will do well as long as there is a cool dry place to nap and plenty of fresh cool water. He will cut down both his food intake and his amount of activity. It must be remembered that going from an air conditioned place into the boiling heat can be disastrous. Abrupt changes in temperature are extremely hard on a Saint. WHAT ABOUT HEALTH ISSUES? 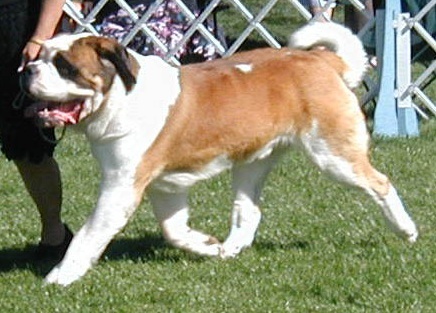 The Saint Bernard, like any large breed, can have various health issues including hip dysplasia, eye problems, and heart problems. 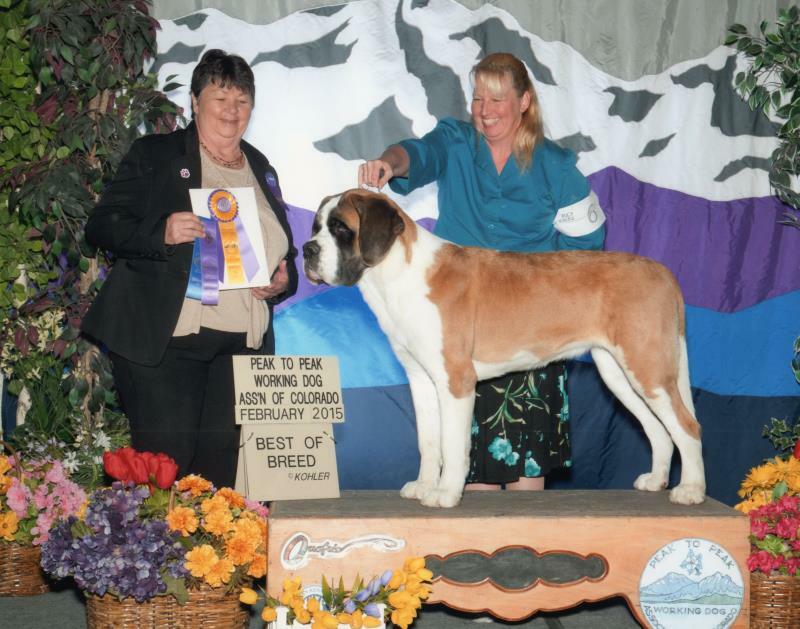 Check with your breeder and be sure that both parents have been OFA (Orthopedic Foundation for Animals) certified free of hip dysplasia, CERF (Canine Eye Registration Foundation) certified for eyes, and they've been checked for heart problems such has cardiomyopathy. Found out as much information as you can about grand-parents, great-grand-parents, etc. WHAT IS THE AVERAGE LIFESPAN? 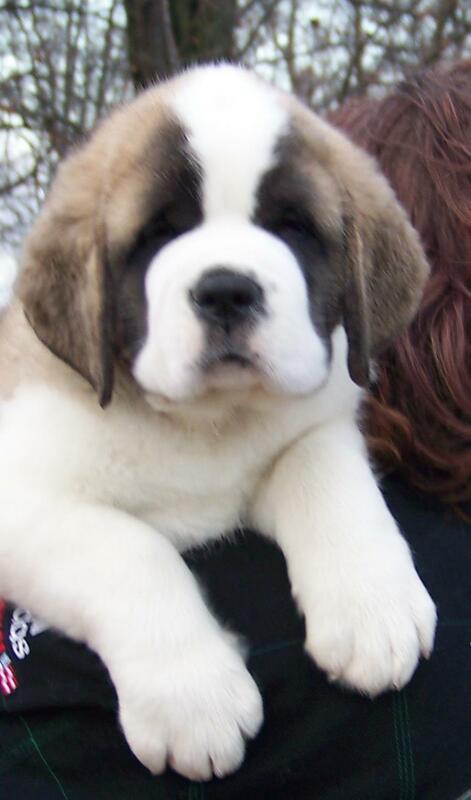 The average lifespan of a Saint Bernard is about 8 to 10 years. Some will live longer, of course. Unfortunately, some will not live as long. 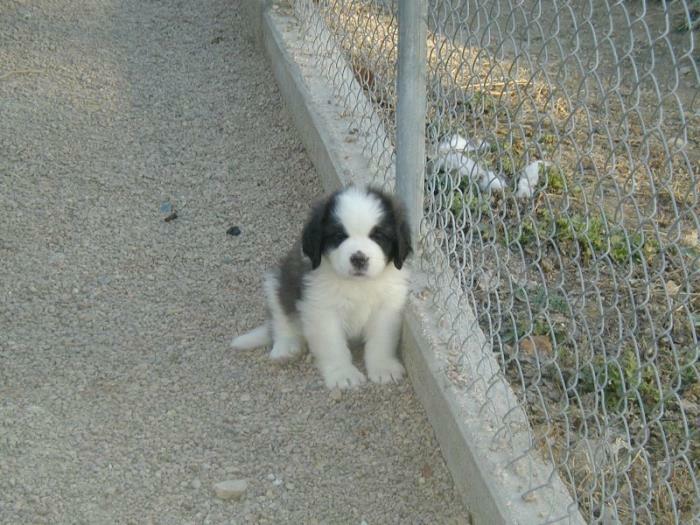 Buying from a well-respected breeder who breeds for longevity, health, and temperament will increase your chances of a long-lived Saint Bernard.